Hot coconut oil massage is one of the most interesting proposition offered by our ThaiSun salons. Coconut oil can successfully replace many cosmetics in shops. It's known since hundreds of years as a compound of natural body care products. It' s also widely known as the healthiest oil on Earth. Coconut oil contains many vitamins and minerals, which absorbed by skin moisturize and regenerate it. Massage perfectly reduces tension in muscles, releases body and mind from somatic symptoms of stress- one of the biggest civilization disease of our times. During treatment our body produces endorphins ('hormones of happiness'), so this treatment shows also anti-depressive effect. 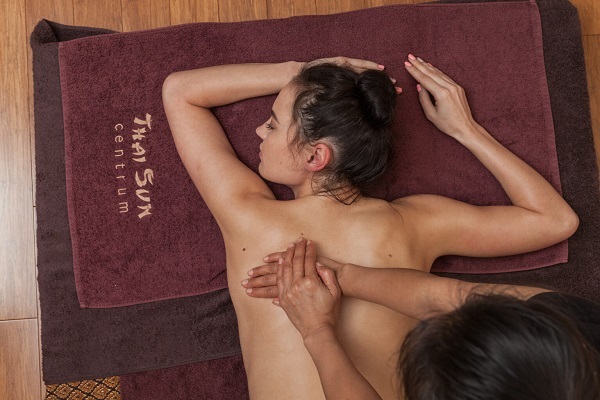 Benefits, which you'd be able to observe after massage, include: faster metabolism, more efficient remove of toxin from organism and more energy. It'd easily take you into new sensory dimensions. We offer our clients 2 variants- 60- and 90-minutes massages. There's a possibility of performing coconut oil massage in longer version, however our thai specialists recommend combination of it with treatment such as reflexology or thai facial. If you have fast-paced, stressing lifestyle, it's ideal choice for you. People, who want to improve condition of their skin or just to get into better mood, would be also satisfied with this massage. Coconut oil massage does not require any special preparations. Before treatment, we'd give you disposable underwear. Many ingredients of coconut oils has beneficial influence on skin and complexion. Linoleic acid improves moisturization, accelerates skin cells renewal, regulates sebaceous glands. Vitamin E is a natural antioxidant, which would help you in keeping skin in a good condition. In temperature colder than room temperature it does not seem to be an oil. It's in solid state and reminds hard butter in consistency. After heating, it becomes liquid and transparent. Coconut oil consists of saturated fatty acids. Particles of coconut oil are really small so that it can be easier absorb by skin. According to knowledge of ancient thai massage school, treatment encompasses whole body and it's performed in lying position. At first, you'd be laying on your stomach. Masseur' d slowly and gently put oils into your body, starting from legs. When massage of one leg is done, it's wrapped with towel to let oil easily penetrate skin. Ritual is repeated with other leg. Afterwards, masseur concentrate on upper parts of the body. Next, you'd change position to laying on the back. At this points, massage focuses on your chest, forearms and arms. Treatment ends up with gentle face and leg massage. 'Warm' coconut oil massage makes skin more moisturized and velvet-to-touch. Vitamins and minerals nourish skin and antioxidants rejuvenate it. Massage strengthens the immunity and regulates blood circulation. It's amazing treatment for skin, but also for whole body and soul. It can be done in 'four- hand' version. Massage is performed in disposable underwear. At the beginning, you'd lay on your stomach. Oils are really slowly massaged into your body, starting from legs. Once massage of first leg is done, it' s wrapped into towel to let skin effectively absorb oils. Similarly to thai massage, after hands, forearms and chest massage, you'd change position to laying on back. Whole ritual, from feet to neck, would be repeated. Treatment ends up with gentle face and head massage. First effects of massage that you'd be able to observe straight after it are blissful relaxation and improved mood. relieve from stress and deeply revitalize.